If you don't see a stage that fits your needs, call us and see what we can do for you. 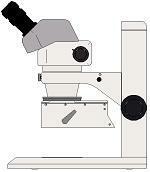 The Oblique Viewing Accessory attaches to Nikon SMZ 660 and SMZ 645 stereoscopic microscopes. The Oblique Viewer provides lever selectable direct view or parfocal 45 degree oblique view. In the oblique mode, magnification is 0.5X. The motor unit can be controlled manually or through standard RS-232 commands. The controller provides precise control of position of the angle of the Oblique viewer. The position is available and controllable via RS-232. Continuously rotatable through 360 degrees either manually or by optional manual pushbutton controlled motor upgrade. An optional foot switch is available for use with the motor upgrade. Changes from normal to oblique viewing with a single lever. Easily attached / detached from microscope. Fixed 45 degree tilt angle. Usable through full zoom magnification range of .8X to 5.0X. User adjustable centering and parfocality of oblique view.